The training program is structured to provide specific training targeted at the different aspects of patent administration and at different experience levels. (IP Administrators), who prepare for the certified Dutch Exam Formalities Officers. For candidates throughout Europe separate modules are offered, increasing in complexity from beginners courses to in-depth courses. 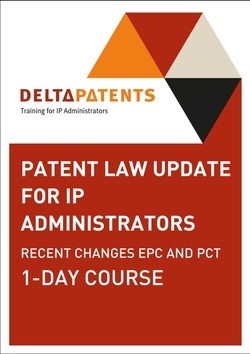 This 1-day course will bring participants up-to-date with recent law changes related to the European Patent Convention (EPC) and the Patent Co-operation Treaty (PCT). Furthermore, as a ‘special topic’, we will discuss the EP opposition procedure on an in-depth level and to conclude we will highlight the EP Unitary Patent and Unified Patent court and give some background on the public debate on patenting fruit and vegetables. If new interesting topics appear, we will set a new date for this course. This 2-day course is specifically designed to introduce key intellectual property (IP) concepts and terminology, to give background of the IP systems, and to provide an overview of the main patenting routes and procedures. Emphasis will be put on administrative aspects of patents. In particular, participants will have an understanding of the various patenting routes, the patent application procedure and the role of IP Administrators in the procedure. Furthermore the participant will get knowledge of the EPC procedure from search to grant as well as of the validation procedure including translations according to the London Agreement. The participant will also be able to carry out and monitor the main procedural steps during all these phases. By the end of this 2-day course, the participant will be able to file a PCT application using the RO/101 form, invoke priority, deal with the most frequently occurring issues for getting a filing date, and deal with both formality and prosecution tasks during the rest of the international phase and EP regional entry. Participants will have a good insight in time limits, remedies and fee payments and will be able to put the knowledge into practice. Furthermore the participant will be able to perform and monitor the main procedural steps during all these phases. All our courses as well as tailor-made selections of our courses can be provided in-house. In particular, aspect can be included from the registration procedure for the Benelux, European and International trademark and design procedures. Particularly for groups of at least 8 participants this provides a very cost-effective training.